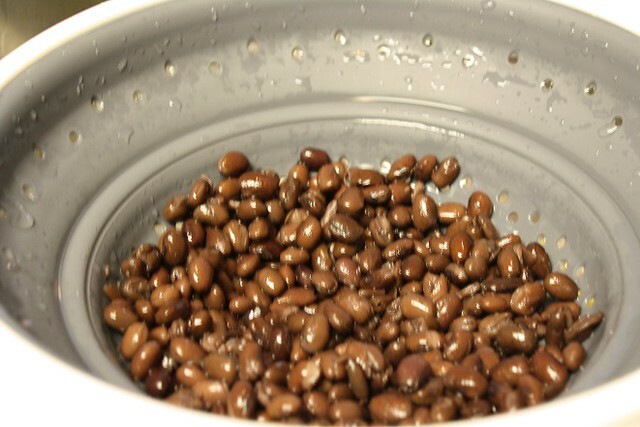 Begin by draining and rinsing your can of black beans, so that you can get rid of the salty water they’re in. 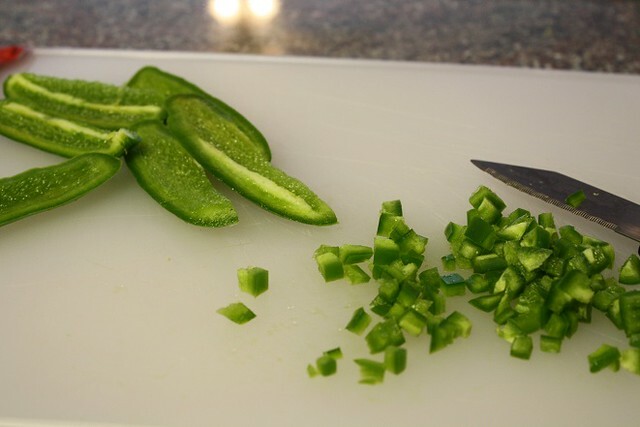 While the beans drain, cut up and finely diced a jalapeño, and be careful not to touch your face or eyes. Because I wanted to avoid touching the seeds and ribs as much as possible, I used a method my mom talks about on her blog My Eclectic Range where you cut off the cheeks of the jalapeño. Be sure to check out her page, because the shrimp salad she made this week rocks! 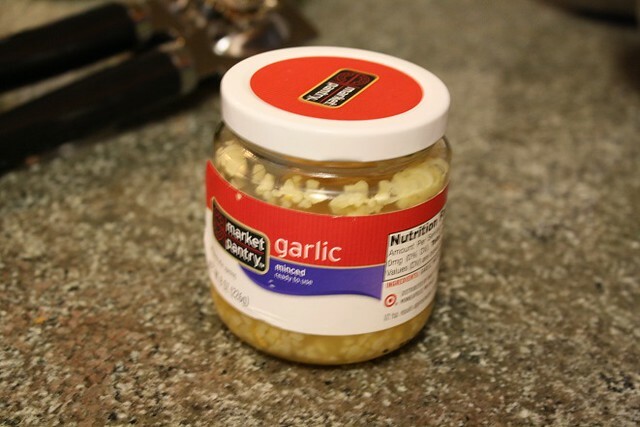 Sorry that I forgot to show the garlic, but I used my handy minced garlic and a garlic twist is another great tool. Heat a bit of oil in a sauce pan over medium heat, and I used about 1 tablespoon of olive oil. Then get the Mexican Quinoa with Lazy Guacamole cooking started and add the chopped jalapeños along with 2 cloves of minced garlic to the hot skillet, and cook for about a minute. Once you can smell the jalapeños and garlic, you know you’re good, and you can move to the next step. 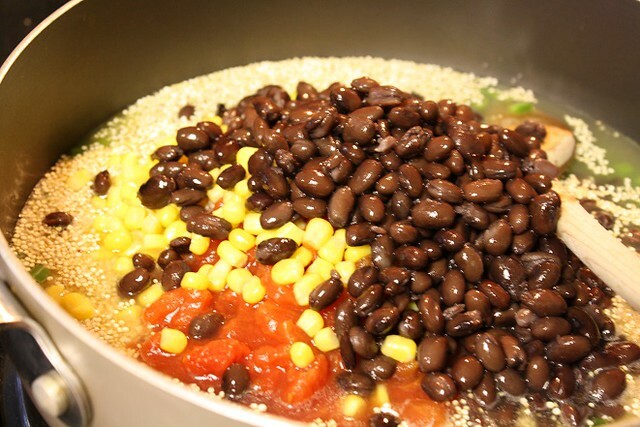 Then add the cup of rinsed and drained quinoa, 1 1/4 cup of broth (I opted for chicken broth), the drained black beans, the can of diced tomatoes, 1 cup of corn and 1/2 teaspoon of Kosher Salt to the pan. Then stir it together and let the mixture come to a boil. Once the quinoa mixture comes to a boil, put the lid on and turn the heat to a low heat, so that the mixture simmers for about 25 minutes. 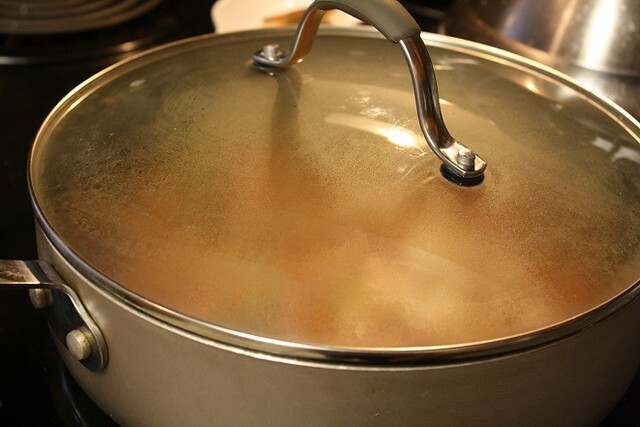 If there is still liquid in the pan after 25 minutes, just turn up the heat a little, remove the lid, so that you can more quickly get the liquid to absorb. 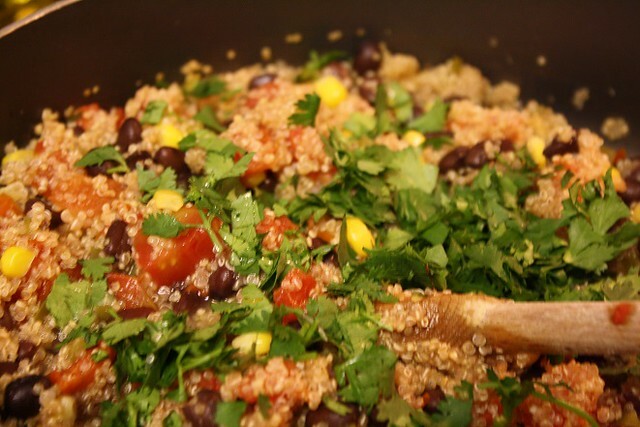 While the quinoa cooked, wash and pat try a handful of cilantro, so you have about 1/4 cup. 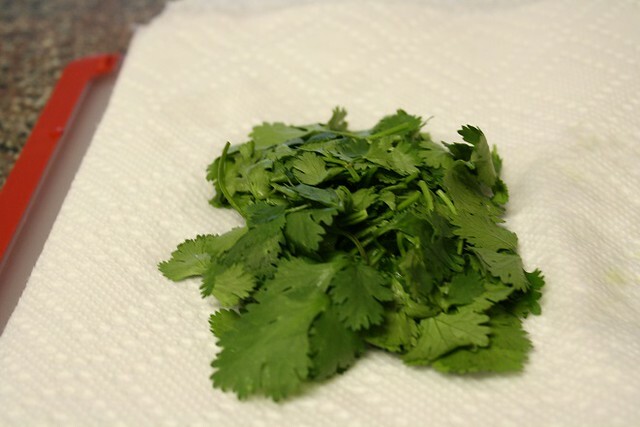 Then just chop up the cilantro, and I like chopping it on the paper towel so it can’t go moving all over the place. 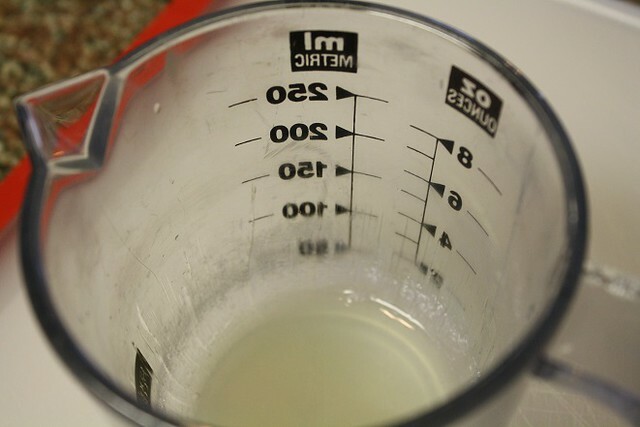 Then I moved on to the lime, and cut up half a lime and juiced that half and set it aside until I was ready for it. With less than 10 minutes left for cooking the Mexican Quinoa with Lazy Guacamole, I started on the lazy guacamole part. 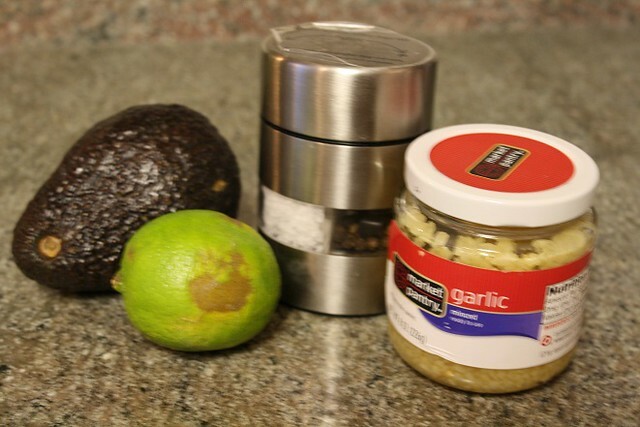 It’s super easy, so grab 1 ripe Avocado, 1 Lime, Salt, Pepper, and 1 clove of minced Garlic. 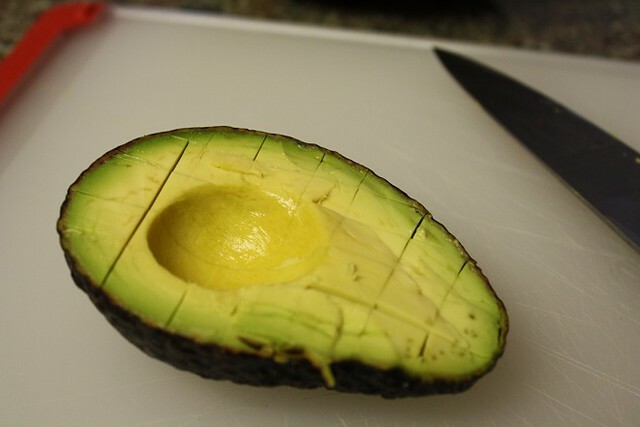 Cut the avocado in half lengthwise, then carefully use a knife to strike the pit and pull it out. Then dice the avocado up in the skin as you see above so that you can easily scoop it out of the shell into a bowl. And then just mash the entire avocado with a fork. 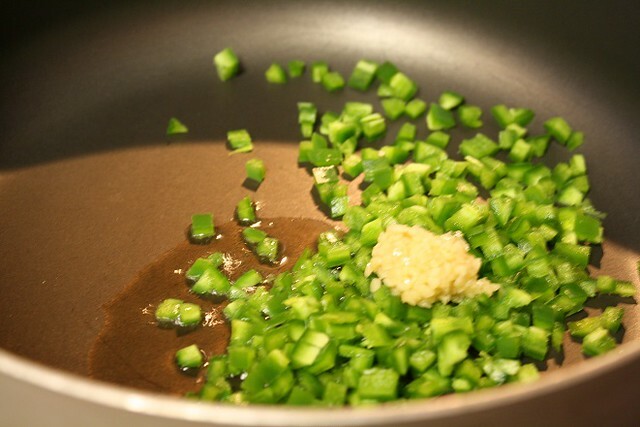 Then add 1 minced garlic clove, salt & pepper, and the juice of a lime. My lime was very juicy, so I just used half a lime. 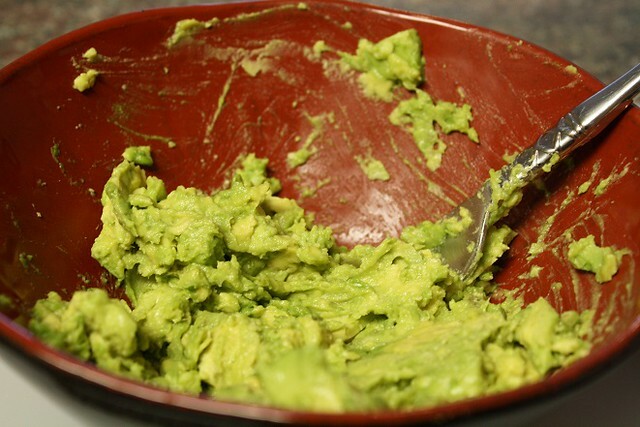 Then just mix the lazy guac up and you’re all set, and it’s so easy and really painless. Then my quinoa was done, and you just want the liquid to have been absorbed so just remember what I said above and turn the heat up and cook with the lid off to get extra liquid evaporated after 25 minutes. 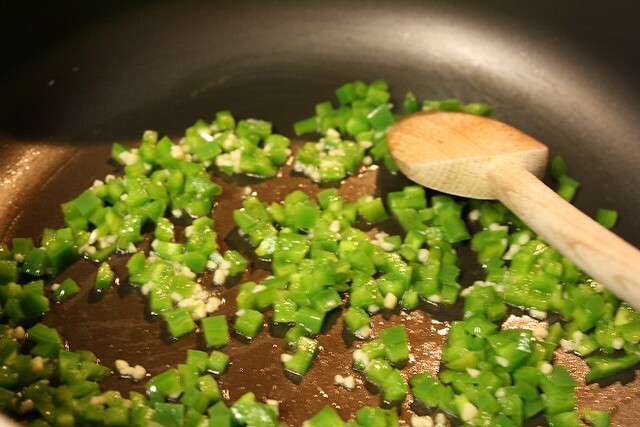 Then add 1/4 cup of the chopped cilantro and the lime juice you set aside to the pan. 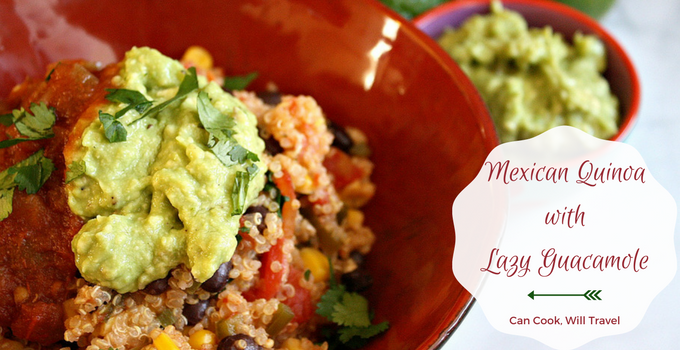 Finally mix up the Mexican Quinoa with Lazy Guacamole, and serve it straight away. Doesn’t that look fabulous and so colorful, and I added salsa and cilantro to my lazy guacamole, and it was perfect! So satisfying, fresh, and healthy! Happy cooking my friends! You'll love this seriously delicious and healthy dish! Begin by prepping your veggies. 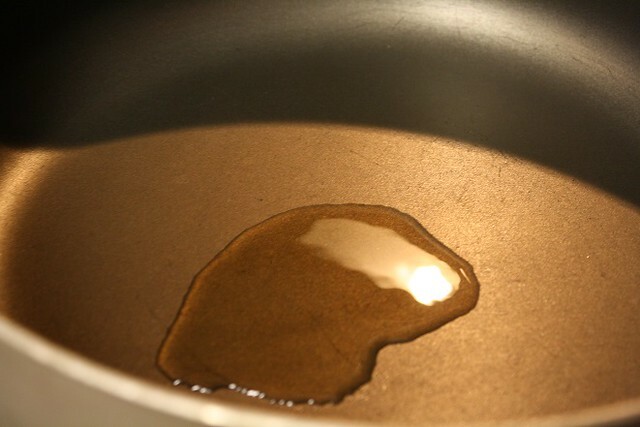 Then add a teaspoon of olive oil to a medium-sized pan over medium heat. Add the garlic and jalapeños to the pan, and cook until fragrant (about a minute). 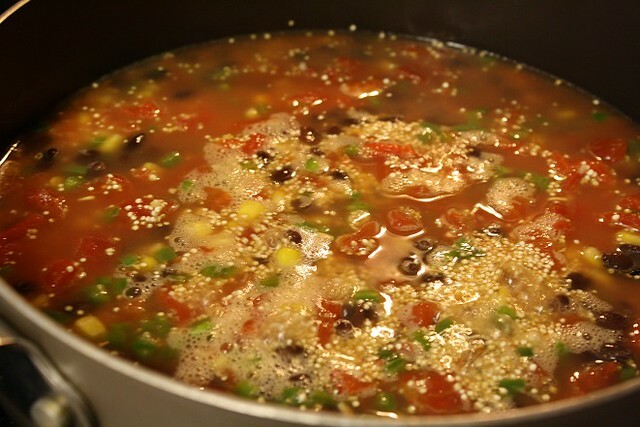 Then add the quinoa, broth, beans, tomatoes, corn, and salt to the pan, and bring it to a boil. 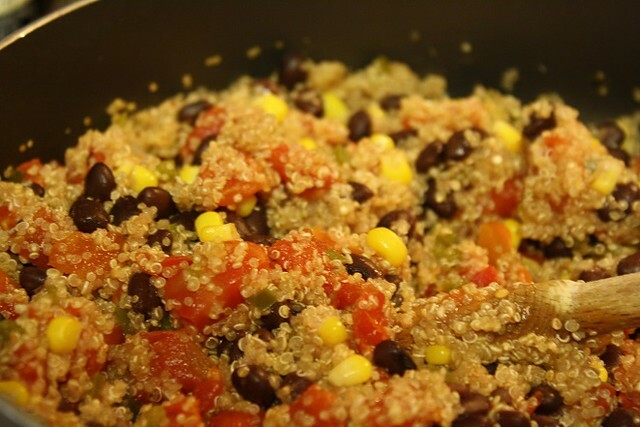 Reduce the heat, cover, and let the quinoa simmer for 25 minutes, or until the quinoa is cooked and liquid is absorbed. 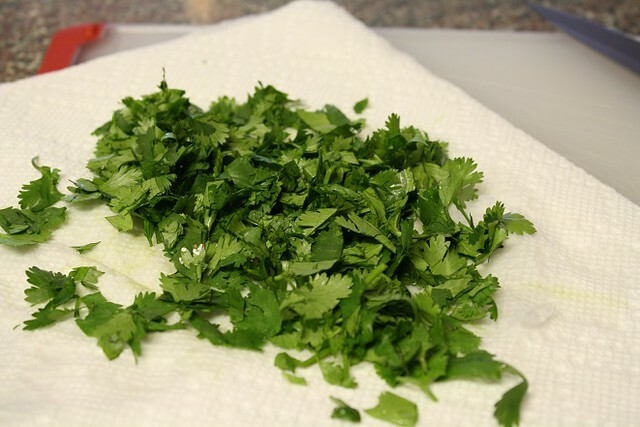 Remove the pan from the heat, and stir in the cilantro and lime juice. 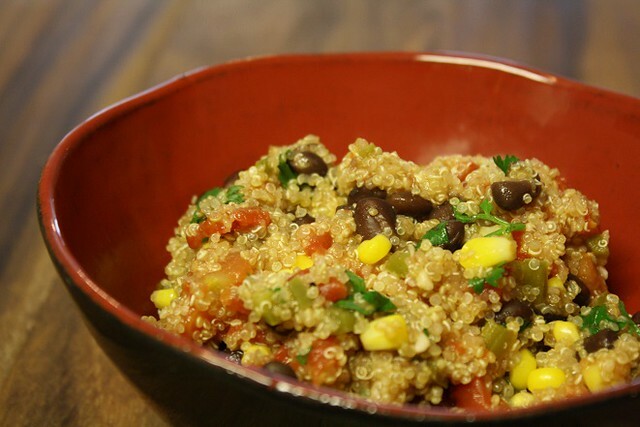 Serve the quinoa in bowls and top with your favorite toppings. Enjoy! 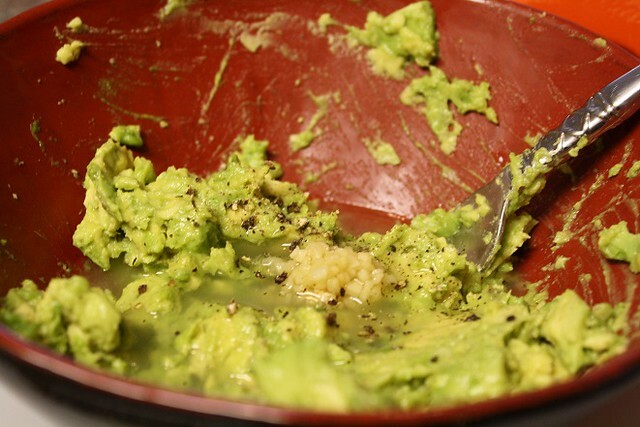 Add the avocado, lime juice, minced garlic, and salt and pepper to a small bowl. 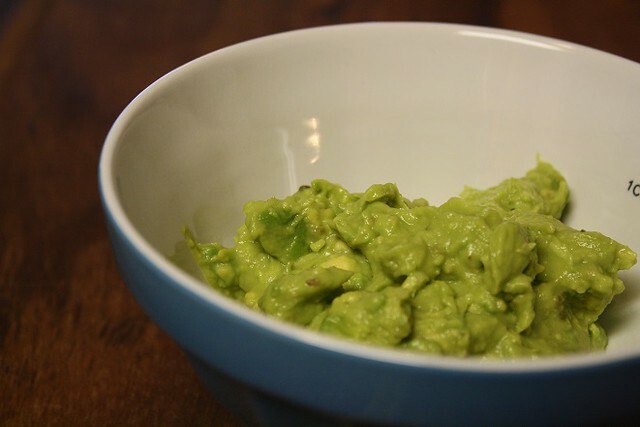 Use a fork to mash the avocado and combine the guacamole really well. That's it! 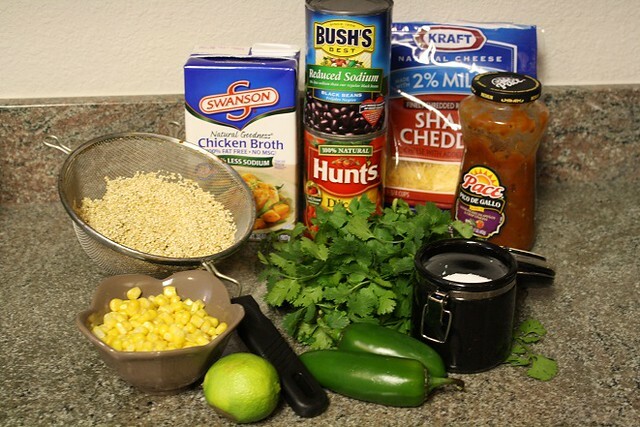 Quick Tip: For a dairy free meal, top your quinoa with lazy guacamole, salsa, and chopped cilantro! Yum! Previous Post: « It’s Pad Thai Time!